Bandhani is an expression used to describe textiles designed using a tie and dye technique where a plain fabric is tied tightly using thread in multiple locations prior to dyeing. This results in simple or complex patterns comprising of dots, squares, waves or stripes. Traditionally, bandhani was done on cotton fabrics using natural dyes and was used by various communities in India for important ceremonies such as weddings. In Gujarat, bandhani work is primarily done by the Muslim Khatri community, and both men and women are involved in the process. The term bandhani is derived from the Sanskrit word bandha, and gujarati term bandhavanu, which mean "to tie." Bandhani refers to the technique as well as the finished product, and is also commonly known as Bandhej. Kachchh is home to many of bandhani's most prolific artists, majority of whom belong to the Khatri community. Women do the laborious work of tying while the men generally do the dyeing and business management. There are exceptions to both, especially as the craft has grown from a familial practice to a community-wide business with a global reach. Earlier, bandhani was used and produced predominantly for the local communities across Kachchh: each having their distinct identity. 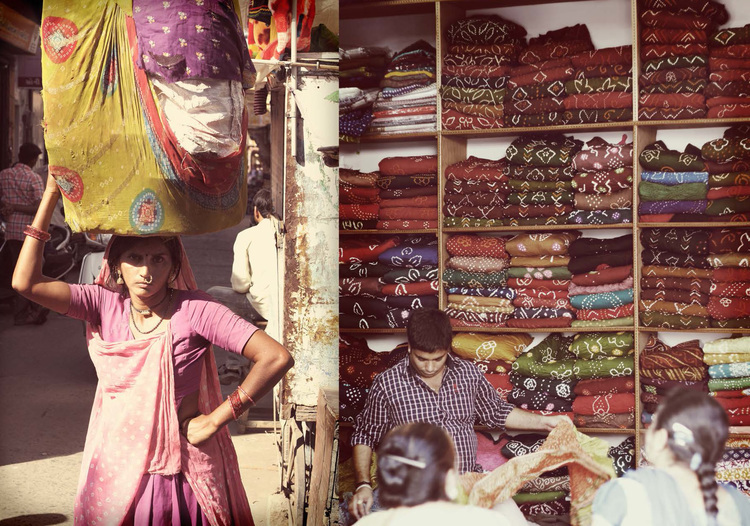 Over time, the users of bandhani have grown as artisans encountered newer markets. Garments have evolved from odhanis (shawls) and abhas (dresses) to saris and shawls available in various materials, qualities and price ranges. The technique has mostly remained the same, but there has been a marked increase in the number of people participating in the craft. Women from communities other than Khatris are now earning incomes as tying artists, and doing so from the comfort of their homes. Many of them are proud of their work and also enjoy it. The word Khatri is derived from the term Kshatri, as the Khatri community is believed to have originated from Brahma Kshatris, many of whom settled in Gujarat, Rajasthan, Punjab and other parts of India. Many generations ago, some of the Brahma Kshatris converted to Islam, and there are several stories linked to this. One is of a man who settled in Mundra and had a fear of being cremated after death. He had been staying at an Ismaili Khoja's house, and chose to embrace Islam. According to the Khatri Itihaas, it is said that the King of Kutch, Khengarji I (1548-1585) established the regions of Rapar, Mandvi, Bhuj and Anjar, and invited communities from the Sindh to settle there in order to boost business, trade and industries. People from both religions (Hindu and Muslim) are said to have answered his call, many of whom worked in bandhani. During the time of nobility, many of Kachchh's bandhani artisans were employed by the king, and have continued to make bandhani for the wealthier classes as well as for their own use. The people that later moved away to Jamnagar, Rajkot and Jaipur became known as Halai Khatris. Traditionally, Khatris have been weavers, dyers and printers, while the women have always been involved with the tying of bandhani. All Khatri women are taught the art of tying before they are married, as it is a matter of community pride and tradition. The Khatri artisan’s businesses have all changed over time due to changes in the availability and cost of raw materials, market preferences, and also advances in technology. The Khatris have adapted accordingly, and thanks to a combination of their hard work, government and NGO assistance, many have received exposure through exhibitions and have even entered international export markets. Along with bandhani, Khatris practice ajrakh (block printing), discharge printing and batik are all resist techniques still practiced in Kachchh. Abdasa, Mandvi, Mundra, Anjar, Bhuj, and Nakhatrana are the most active centers of bandhani production. Each region has its own specialty of tying and dyeing. Other regions of Kachchh such as Rapar, Bhachau and Lakhpat were all involved with bandhani production at one time, but the number of artisans still working there has reduced to a very small number. For various reasons, artisans have either left the profession or moved to another location. There are still communities living there that use bandhani, or a few tiers in some villages, but compared to all the other talukas (regions), these areas have no existing specialty in bandhani. For the purpose of this exhibition, we spoke to a small handful of artisans in each region to get a glimpse into the lives and histories of Kachchh’s artisans. We found stories of hope, risk, creativity, determination and passion. This is only a small collection of many thousands of stories, and is not representative of all the creative work that can be found across Kachchh.